The pictures would be worth the five stars alone, but the videos and the ways to browse between articles makes it a must have app. Great job. Unfortunately Paris Match has abandoned its previous iPad interactive version which was amazing. It probably could not justify the cost of continuing to produce a truly digital version of this magazine. So now it has taken a giant leap backwards to a dull printout out of the magazine. What is lost? The ability to click on an image and see it in high resolution. With a printout you have to pinch and zoom to see a pixelated version of an image. The interactive version had no advertising. Now, with the printout, you see every ad. The interactive version had media links to video and music which was awesome. In the printout version, they have QR codes, which is ironic because they are useless as they are meant for a physical magazine! A lot of thought also went into the formatting and navigation in the interactive version which gave it a special feel. 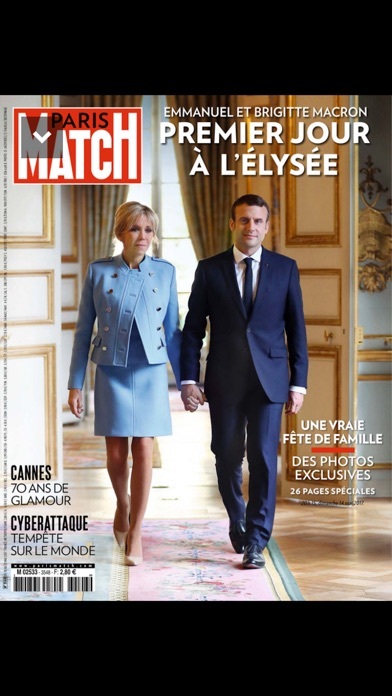 Too bad Paris Match, you had a great thing going and now all your digital subscribers lose. I love the application, and the content is great, but the download of the latest issue (June 23rd) is almost impossible. It stops, and restarts in another section, I have been at it for more than 20 hours and have only half the magazine. Download should be for the whole issue, not parts of it. 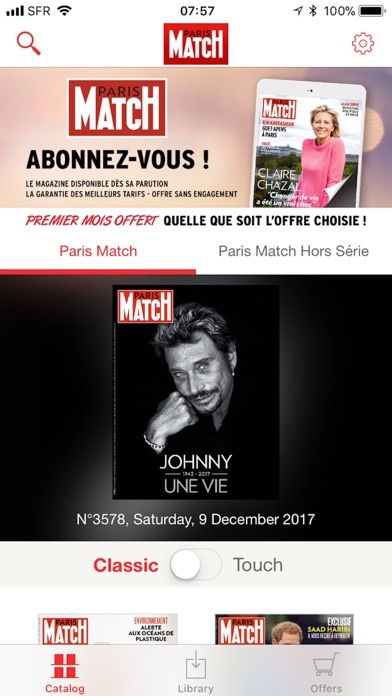 Vraiment très décevante l'application Paris-Match! Tout d'abord, la lecture ne se fait qu'à l'horizontale, ce qui est un peu gênant si on veut avoir une vue globale d'un article. Mais le plus embêtant, et qui peut vous inciter à ne plus ouvrir l'application, c'est que si vous mettez votre iPad en veille, l'application redémarre sur la bibliothèque et non pas à la page ou vous l'aviez laissée. Prise de tête pour revenir à la page! Merci Paris Match pour nous offrir d'une expérience si décevante avec votre version iPad. Je préfère finalement de loin la version papier! Paris Match is awesome on the iPad! Paris Match is clearly leading the way for magazines of the new millennium. This eMag is fun and engaging. When can I subscribe? Make your own decision on content—which I enjoy—but the navigation is terrific, chiefly because of the horizontal ‘band’ that you pull down from the top of the page that allows an easy way to leaf through the magazine. Enjoyable to use. J'apprecie beaucoup l'application. Je remarque qu'en tant qu'abonne je recois le magazine buen plus tard que sur les plateformes comme lekiosk ou e-press. Y-a-t-il une raison a cela? Y. Another download manager masquerading as a "free" app. Complete BS. C’est une très bonne expérience. Le app est très agréable pour moi! Merci beaucoup! Au revoir! I enjoyed Paris Match's approach of the iPad. Their design is elegant, almost intuitive navigation - I like discovering links or additional info within an article. Obviously this is not the full newsstand version but the article selection was interesting. Congratulations! My French is limited, first of all. But in the event that you have bought a few issues of the mag, is it possible to back them up to your hard drive? Second, the free sample with the Michael Jackson cover doesn't seem to auto-save the content. Every time I re-launch the issue, it starts from scratch to re-download the content it had downloaded before. Third, the download is slow. Very, very slow! But the photos are EXCELLENT! Much better than what you see in the American mags. This new version is awful. I have been subscribing to the digital version for years, and I enjoyed reading the magazine. Now, I don't even want to look at it. In fact, when my subscription expires, I will not renew. Quel dommage, Paris Match! Since this has been updated, clicking on most of the options causes a text box to pop up with a message which seems to translate from French as "The topic has not yet been downloaded. The subject is automatically downloaded when you access the network." What is that supposed to mean? If I was not "accessing the network" at all, then why would some of the options work? Keeps crashing and trying to charge you multiple times for the same thing. Too bad. I like the magazine but the app is a waste of time and money. Three stars because we lie the magazine. 0 stars to the developer for response. We are avid readers of this magazine and have a subscription. When we have been requested to pay for an issue, while subscription still in force, the APP store suggested we write the developer. After three communications to the developer the only response was from a machine acknowledging receipt. What an unprofessional behavior. Très déçu par le lenteur de chargement??? I tried this app but the articles don't seem to want to load and the content is not refreshed that often too bad because it would be nice to read Paris match. I bought an edition several weeks ago, but with the update, I've lost it. Contacted customer support twice and they told me to remove and re-download the app, the go to account>restore. It just gives me an error. I used to read Paris Match as a French student, and always enjoyed the photojournalism format. I've long wanted to subscribe to the magazine in recent years, so I am pleasantly surprised to see this free app. It sounds like this is their first foray into app-dom, with more ambitions for the future. Brush up on your French and enjoy the cool photos. iPad is all about instant access.... 2 days to download a magazine is simply unacceptable. At least download those heavy adds last! Paris Match has unfortunately abandoned its amazing iPad specific implementation with this version. It is now just a printout of the magazine. What a good thing they had going, I am really upset to see it go. I had enjoyed it. I'm not sure how they intend to deliver more content in the future, will they update this app with the next edition or will I have to get a new app (which would be cumbersome). However sustainability issues aside I really enjoyed my time with Paris Match. There were only a small number of stories but these were beautifully done. They featured lovely photos and some interesting commentary, if you speak french. The slideshows, with music, were well done too, however the speed between transitions may be too quick for some non-native speakers to read the captions. I particularly liked that it clearly was adapted to a unique iPad oriented presentation, with everything laid out visually on a single screen to start. 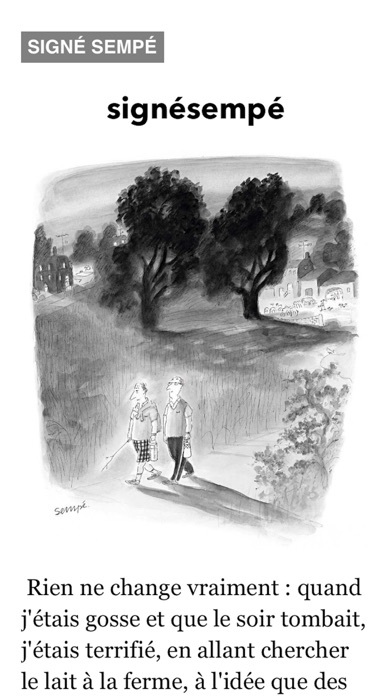 It wasn't, just a print publication digitized. Especially given the price it is worth a try for some beautiful photographs and a chance to practice French. Definitely the future is here as far the potential of the iPad. Interactive ads, movies, additional pictures to the stories. Fantastic. Maybe the American magazines could learn from that? Maybe too much to ask.Unfortunately is not free (just the first number) and I will never pay for it. It should make it clear from the beginning that it's not free, just a download manager. Excellent idea specially for French speaking people living abroad.Cannot wait for the next edition. won't load beyond splash screen. ...nice logo. The design of the magazine is simply outstanding. I downloaded the app just to see the design. Other news apps have much to learn from this app. I wish they also had the English version. Download just for heck of it to see an app designed with French creativity. Merci Match. The download problems were fixed and I've got the entire beautiful magazine to read. Great job! This new update is terrible. I lost all my back issues. The new format is confusing. So bad, so long and now I'm paying since 3 months and I don't access to the mag. Stupid as Lagardere himself!